There is little more likely to exasperate a person of sense than finding herself tied by affection and habit to an Enthusiast." Julie knows from bitter experience: her best friend, Ashleigh, is an Enthusiast. Ashleigh's current fancy is also Julie's own passion, Pride and Prejudice, and the heroine's quest for True Love. And so Julie finds herself swept along with Ashleigh, dressed in vintage frocks and sneaking into a dance at the local all-boys' prep school. There they discover several likely candidates for True Love, including the handsome and sensitive Parr. And Julie begins to wonder if maybe this obsession of Ashleigh's isn't so bad after all. . . . 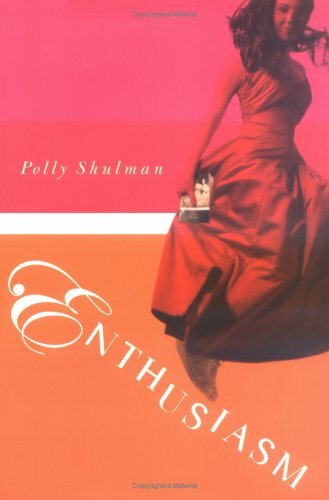 I bought Enthusiasm through a catalog that my English teacher would give out each month, and when I saw it, I said “Oh, that looks cute.” So I ordered it, and immediately started reading it when I arrived. And I immediately loved it. This isn’t a heavy novel, or complicated, but it had just the perfect amount of normalness, simplicity and fun that I enjoyed reading it more than most books, and I finished it quickly. Julie was a great character, so realistic and smart. She’s really not a girl you’ll find in most YA books today, which added so much to this already great book as I read it. I obviously had a soft spot of Ashleigh, seeing as my name is Ashley. Ashleigh and I are also very similar personality wise, except I’d like to think I wasn’t so fickle. Everything about this book was good. The plot, the characters, the writing, and even the cover. This is well worth the money and well worth the read. If you’re looking for a nice book to snuggle up with on a rainy or snowy day, this is definitely your book. I give this novel 5 out of 5 stars. I got this at a book fair a couple of years ago, and I loved it too! Everything about is just so perfect and fun! Great review! This sounds really adorable. I found this at my local library a few days ago and wasn't sure if I wanted to pick it up but now I will. Thanks!